Special Notes for this item. If you are looking for parts, the BRAND and MODEL No. # (if provided, this item might be compatible with) listed below are just for your reference as shopping guide. Please DO double check the size and shape of your original parts, and compare with the specifications for our item before ordering. 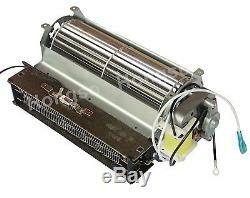 Twin Star Electric Fireplace Blower Fan + Heating Element (motor on left side). 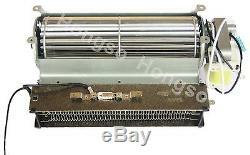 For Twin Star brand electric fireplace and other Wood / Gas Burning Stove or Fireplace. 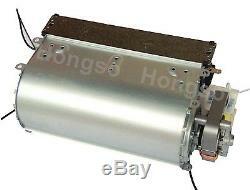 Original parts from factory direct, UL listed, Durable, Quiet. 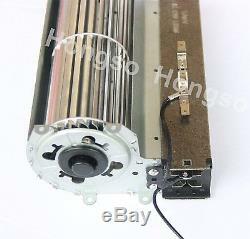 Blower fan Size: Diameter 60mm x L: 185mm, Length x Width x Height (Inches): 9.75 x 3.73 x 3.23. 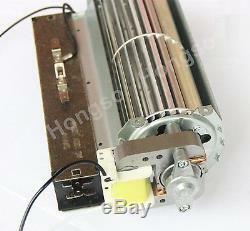 Heater size: L20035(mm) ; 1350W, 120V 5. Temperature Protecting PTC: 105 deg. Please measure the space for installing this blower in your Stove or Fireplace, and compare with the dimension of this blower. If you have any questions or concerns, please don't hesitate to contact. Motor Type: AC Shaded Pole. Speed: 2.5-3.1 m/s. Frame Material: Aluminum + galvanized steel. We are not responsible for wrong/ undeliverable address, especially the P. We care about our valued buyers, if you have any questions, our Customer Service staffs will be very glad to help you. We try our best to reply to your emails as soon as possible, however, due to high volume of daily incoming emails and time zone difference, we may not be able to reply your emails immediately. The item "Twin Star Electric Fireplace Blower Fan + Heating Element (motor on left side)" is in sale since Wednesday, October 19, 2016. This item is in the category "Home & Garden\Home Improvement\Heating, Cooling & Air\Fireplaces & Stoves\Other Fireplaces & Stoves". The seller is "2013decoshop" and is located in Charleston, Tennessee. This item can be shipped to United States, Canada, Denmark, Romania, Slovakia, Bulgaria, Czech republic, Finland, Hungary, Latvia, Lithuania, Malta, Estonia, Greece, Portugal, Cyprus, Slovenia, Sweden, Belgium, France, Ireland, Netherlands, Poland, Spain, Italy, Germany, Austria, Mexico, Switzerland, Norway, Croatia, Costa rica, Dominican republic, Panama, United Kingdom.